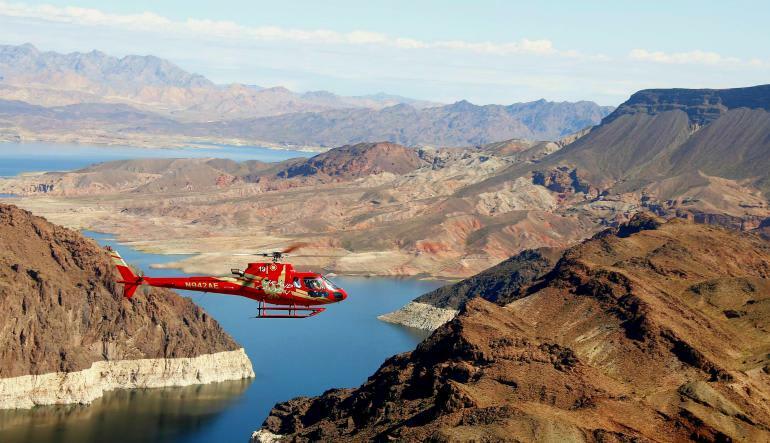 Your Las Vegas helicopter touring adventure begins with limousine transport from your Las Vegas Hotel to our exclusive Grand Canyon Heliport terminal near McCarran Airport. Las Vegas is all about what’s possible. Case in point: it is possible to see the most exquisite works of Nature, and the most creative works of modern man all within a couple of hours! 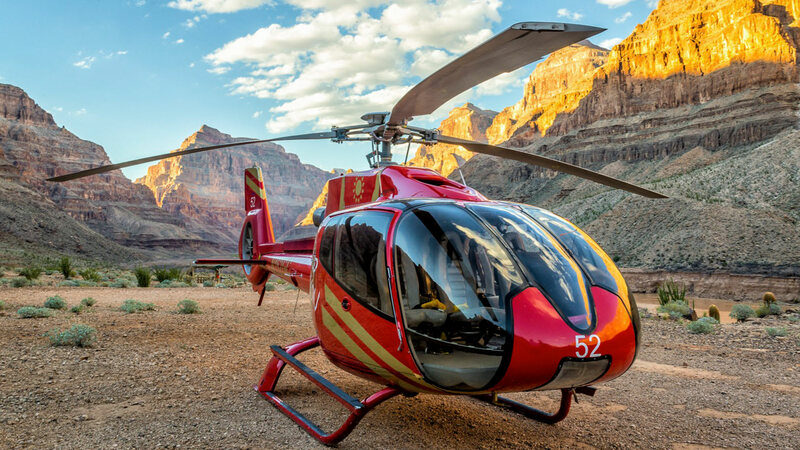 Your Las Vegas helicopter touring adventure begins with limousine transport from your Las Vegas Hotel to our exclusive Grand Canyon Heliport terminal near McCarran Airport. Then, climb aboard! Our ultra-modern touring helicopters are super comfortable and tailor made for aerial sightseeing. Descend 4,000 feet and land at an exclusive location for our passengers to receive the best experience. You’ll get the ultimate eagle-eye view of Hoover Dam, a Depression-era monument to human ingenuity and perseverance; Lake Mead, one of the largest man-made lakes in the world; the volcanic graveyard of the Black Mountains, silent testaments to the volatility of Earth’s past. 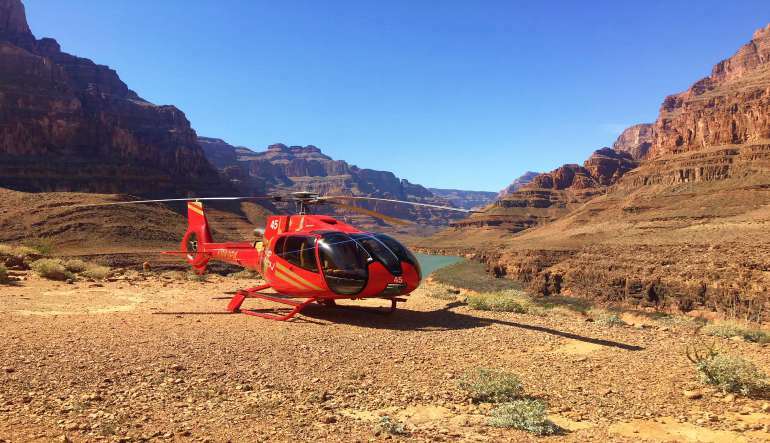 The Grand Wash Cliffs rising up before you signal that the Grand Canyon is up ahead, and thrills begin as your helicopter begins its breath-taking descent all the way down to the bottom! After touching down on the floor of the Grand Canyon on Hualapai Indian Tribal Lands, you’ll assemble with your fellow explorers under an authentic Native American ramada and enjoy a light picnic meal. You can even toast your journey with a glass of champagne or sparkling cider. Take advantage of the opportunity to photograph unusual desert plants, rugged rock formations, and the Colorado River itself. After about 30 minutes on the bottom of the Grand Canyon, it’s time to return to Las Vegas, but not until you enjoy another treat: aerial views of the world-famous Las Vegas Strip! If you think all the colors, all the lights, all the over-the-top architecture looks incredible from the ground, it’s even more spectacular from the up-close-and-personal perspective of a helicopter. At the conclusion of your flight, you’ll be transported back to your Las Vegas Hotel.